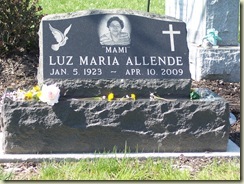 April 10, 2010, marked one year since my mother died. Unlike last year, it fell after Holy Week and it was also a Saturday. (She died on Good Friday of 2009). My wife, two of my sisters and my niece and her brood all visited the cemetery and after some time of standing around and reflecting, we held a brief commemoration service. Linda, my wife, and I headed home since I had an afternoon worship service. It was a solemn ride. It was good to get together as a family and remember. One of Mom’s chief concerns was that we remain united as a family. There has been some fragmentation over the course of the past 12 months, but I’m hoping that is a consequence of the grief that some of my siblings have still not resolved. Relationships have been strained at times. However, I sense they are getting better. I have no poem with which to close. But I am glad to have made this entry. It has been a while. I still miss my mother. I guess that’s something one never stops doing.